TAICHUNG CITY STADIUM. 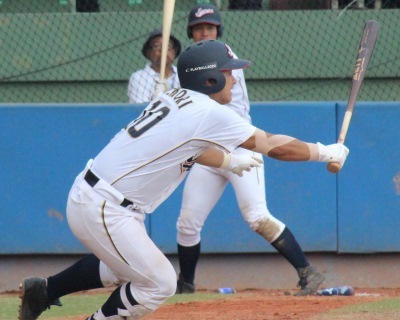 Japan used a pair of three-run rallies to come back against Canada in a 7-5 victory at Taichung City Stadium on Wednesday afternoon. They improved to 5-0 and enter the second round at the XXVI 18U Baseball World Cup with two wins. Canada, last year’s runner up in Seoul, dropped to 2-3 and now have to settle for the consolation round. Japan had allowed just one run in the first four games of the tournament. Canada tagged them for five runs within the first three innings. Tyler O’Neill opened the scoring with a RBI single. An error and a RBI double by Mitchell Bigras made it 3-0. Japan answered through Tomoya Mori’s solo home run in the bottom half. But Canada extended the lead to 5-1 with a RBI single by Gareth Morgan and a sac fly by Owen Spiwak in the top of the third. However then Japan stepped up a notch. They loaded the bases with two outs in the bottom of the third. Satoshi Sonobe cut the deficit to 3-5 with his two-run single to left. A fielding error by Chris Thibideau at second made it a one-run game. In the fourth they loaded the bases again, this time with no outs with a pair of walks and an error at short. Tomoya Mori singled home two runs to put Japan up in front. Yasuhito Uchida followed with a grounder to second, making it 7-5. Canada’s wasn’t able to counter, as three relievers combined to allow just one hit and two walks in the last 6 2/3 innings of the game. They retired 11 of the 24 batters they faced with strikeouts. Taisuke Yamaoka got the win. Starting pitcher Kazuto Taguchi had issued five hits, five runs (4 ER) and a walk in 2 1/3 innings. Brodie Harkness conceded six hits, six runs (5 ER) and three walks in 3 1/3 frames to take the loss. Cal Quantrill settled in after some struggles in the beginning of his relief appearance and kept Canada in the game. However there was no run support and Canada went down. Japan now will move on to the second round as the number-one seed from Group A. Canada has to settle for classification games on Thursday.